Journal: I was woken several times during the night by strong winds and in the morning when I got up at 6:15am it was raining heavily and horizontally. I packed up hoping it would stop and trying to get a weather forecast on the radio. The rain continued and I decided to wait until 10:00am, and if it hadn't stopped by then, I would stay in Adaminaby for another night. Around 9:00am it cleared up although the forecast was for showers all day, strong winds and snow down to 1,400m. The maximum temperature was to be 3°C and blizzard conditions were expected on the peaks. I decided to risk it since I had revamped my schedule and made bookings. Initially progress was slow as I gradually climbed through high plains grazing country directly into the gale-force wind. I couldn't manage more than 15kph and could barely roll down hills. 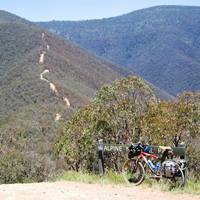 I entered Kosciusko National Park and continued climbing through snowgum forests, some of which had been burnt out. It began to rain, then hail and sleet as I climbed higher. Going down hills was agonising with hail stinging my face. I decided to try and get to Kiandra (35km) for my break, not knowing what was there but hoping for a service station. Crossing the plain before Kiandra in abysmal conditions - blowing snow and sleet - I knew I had to find some shelter. My hands and feet were frozen, I was saturated, and I was still just in shorts. When I got to Kiandra, apart from some boarded up buildings, the only shelter I could see was a Road Traffic Authority (RTA) snow-plough shed. It said "No Admittance" but I went in anyway, figuring they wouldn't object. Later, the RTA guy turned up and was helpful. He discussed my route and said there was a huge hill and some very exposed terrain after Cabramurra. He also gave me some old gloves. I put on my clothes and left for Cabramurra, getting there around 2:00pm after more hail and snow. I had a quick pie and pastie and hot chocolate for lunch and set off for Khancoban, 59km away. There was an enormous hill after Tumut Ponds Dam, and then lots of snow on the ground up high, but no more really bad weather. Then there was a fast descent into Khancoban and one last soaking rainstorm. I arrived at the motel at 7:00pm, checked in, and had a counter tea.